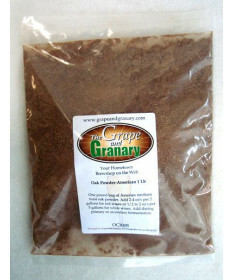 Grape and Granary provides oak powder to home winemakers and wineries which allows them to control the flavors of oak in their Red and White Wines. Oak powder delivers rapid extraction of oak flavor. It is often added to the Primary Fermenter and only requires a few days of contact time. It is often used in French Hybrid wines to minimize any 'foxy' character that may be present. 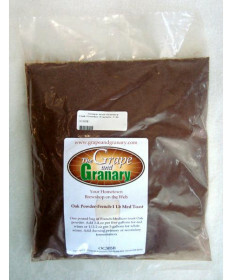 Grape and Granary provides both American and French oak powder. The American oak powder tends to be a bit more bold and intense. 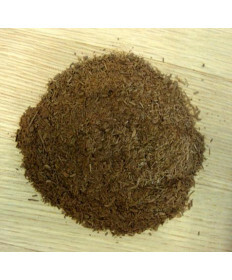 The French oak powder is a bit more refined and provides more notes of vanilla and spice. They are available in both 2 oz and 1 lb packages. Contact Us if you have questions about any of our Oak Powder products for winemaking.